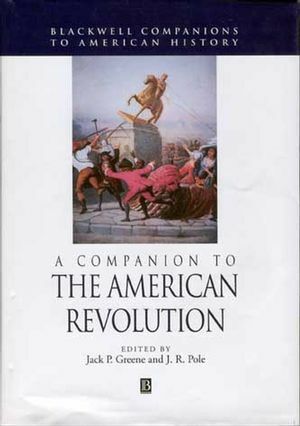 A Companion to the American Revolution is a single guide to the themes, events, and concepts of this major turning point in early American history. Containing coverage before, during, and after the war, as well as the effect of the revolution on a global scale, this major reference to the period is ideal for any student, scholar, or general reader seeking a complete reference to the field. Contains 90 articles in all, including guides to further reading and a detailed chronological table. Explains all aspects of the revolution before, during, and after the war. Discusses the status and experiences of women, Native Americans, and African Americans, and aspects of social and daily life during this period. Describes the effects of the revolution abroad. Provides complete coverage of military history, including the home front. Concludes with a section on concepts to put the morality of early America in today’s context. Jack P. Greene is Andrew W. Mellon Professor in the Humanities at Johns Hopkins University and the author and editor of many books and articles on early modern colonial British America and the American Revolution. Among his recent books are Imperatives, Behaviors, and Identities: Essays in Early American Cultural History (1992), Negotiated Authorities: Essays in Colonial Political and Constitutional History (1994), Understanding the American Revolution: Issues and Actors (1995), and Interpreting Early America: Historiographical Essays (1996). J. R. Pole is Rhodes Professor Emeritus of American History and Institutions, St. Catherine’s College, Oxford, and a Fellow of the British Academy. His books include Political Representation in England and the Origins of the American Republic (1966), The Pursuit of Equality in American History (1978, second edition 1993), Paths to the American Past (1979), The Gift of Government: Political Responsibility from the English Restoration to American Independence (1983), and The American Constitution: For and Against (ed., 1987).